Get together with Beach Club III and have a North Myrtle Beach vacation to remember. The charming oceanfront landscape is most welcoming at this North Myrtle Beach resort and the easy beach access is so pleasing. Beach Club III is a nine-story North Myrtle Beach resort with a covered swimming pool and oceanfront sun deck. Palm trees border the sandy dune line at Beach Club III and sway in the gentle sea breezes. The blue swimming pool is on the ground level of this North Myrtle Beach resort, which is on stilts. There are lounge chairs poolside so you can stretch and relax while the rest of your family takes a dip. A wooden boardwalk leads from the sun deck to the white sandy beaches. All you need to have a ball on the beachfront is a bathing suit. A bucket for bringing home seashell treasures is a good idea and you might want some sunglasses, too. The water is warm in summer and the crashing waves are such fun to jump, especially if you have little children who are in awe of the big, blue sea. This panoramic view of the Atlantic Ocean is jaw-dropping. And you can enjoy these picture-perfect settings from the comfort of the private balcony that is a primary feature of your North Myrtle Beach vacation rental at Beach Club III. Each of these condos in North Myrtle Beach, SC has its own balcony that overlooks the Atlantic Ocean. They are all furnished so you can fully relax while getting some sun and watching the sea during your North Myrtle Beach vacation. 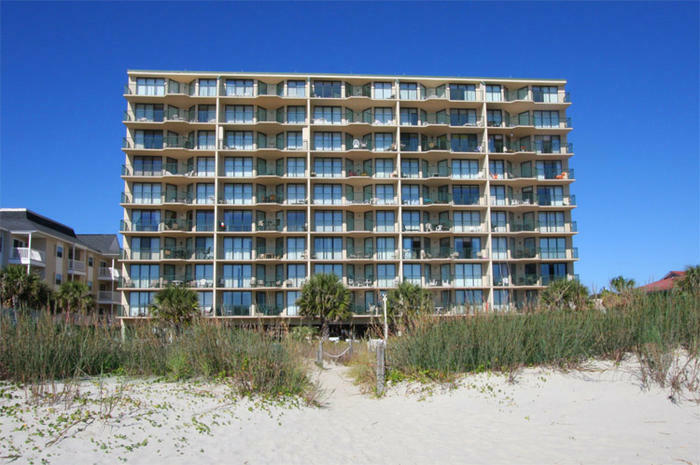 There are three-bedroom North Myrtle Beach condominiums and four-bedroom North Myrtle Beach rentals. All of these North Myrtle Beach vacation rentals have three baths for your convenience.